ECU Joondalup moved up to third on the PS4 National Premier League WA table after a 3-1 win against Mandurah City at the ECU Football Stadium in Week 11. Second half goals from Sam Pollard, Steven McGarry and skipper Gordon Smith gave the Jacks the points, while Ollie McGee scored the consolation goal for the visitors. Jacks assistant Coach David Tough said it was a good performance from the side, especially after a Westfield Cup game in midweek. 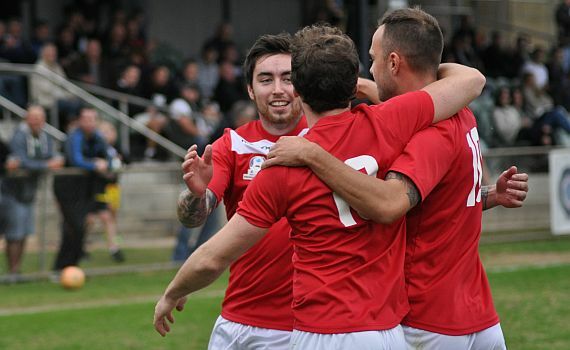 “We had a tough week, and this is the third game in seven days,” he told the NPL website. “The boys are tired mentally and physically, but we knew we just had to get the three points and the lads delivered. Jacks Coach Dale McCulloch kept the same side that convincingly beat Balcatta last time in the league and Tommy Amphlett went close early, cutting in from the flank, but his chip drifts over the top. Mandurah hit back and went close to the opener on 16 minutes. A cross was punched clear by Fraser Greenwood, but it went straight to Matthew Stares, who could only fire wide when well placed. Moments later the Dolphins went close again, this time Jeff Bright cross shot flashed wide of the target. Then just before half time the Jacks lost Daryl Nicol with a nasty injury, and he was replaced by Keylun Pollard. The news at the break was Nicol was sent to hospital, and we wish him a speedy recovery and hope the stitches don’t end his modelling career. The Jacks settled after the break, but both sides still created chances in an entertaining game, but it was the home side that hit the front on the hour. Amphlett made space down the right and crossed into the box and Mandurah failed to clear their lines and the ball found its way to Sam Pollard just inside the box, and the youngster found the bottom corner with his right foot after a slight deflection. It was 2-0 six minutes later. Cian Hirrell was brought down by Mandurah defender McGee and referee Stuart Muldoon pointed straight to the spot. Smith stepped up but his penalty crashed off the crossbar, but McGarry was quickest to react to fire home the rebound. But Mandurah hit back, Bright’s deep free kick picked out McGee at the back post and the big defender made no mistake, heading past Greenwood. Mandurah pressed looking for the equaliser, but on a quick break the Jacks sealed the points. Amphlett raced clear down the right and intelligently squared the ball to Smith who hammered it home from the edge of the box for his eight league goal of the season. The under 20’s also beat Mandurah, with Mark Scanlan’s side running out 2-0 winners. “They opened the scoring witha first time finish from Kieron Craig after a good cross from the left from Marco Chadinha, and they wrapped up the points with a great individual brilliance from Shakeel Alexander as the received the ball on the edge of the box, turned two defenders and smashed it in off the crossbar with his left foot. “With the number of games the boys have played in the last few weeks as well as boys going up to first team, it was maybe not a surprise that we started the game pretty flat and lethargic. We kept the ball well but there was no real intensity in our play. There was a lot of quality in our side we just didn’t capitalise in the first half,” Scanlan said. It was a successful weekend all round with Dean Pickering’s under 18’s also beating Mandurah 7-0. The youngsters led 3-0 at the break with goals to Kieron Craig and a double from Josh Carroll. It was 4-0 with a fantastic long-range strike from Ewan Fawcett, and further goals to Miki Imre, Callum Speed and Ben Hinshelwood wrapped up a comprehensive win.